Your astrology chart (a.k.a. birth chart or natal chart) is made up of many little pieces. They consist of where the planets where at when you were born and how they relate to each other. Studying the patterns and relationships between these pieces gives us a tool for finding information about an individual. Taken as a whole these pieces reveal the story in your astrology chart. This means that you can't define a person with the question, “What's your sign?” You are far more than just your Sun sign. That's why people can have the same sign, but have completely different personalities. More than one planet influences who you are as an individual. How the planets in your astrology chart relate to each other also has an impact. For example, two people could have the Sun in Sagittarius, but one could have an ascendant in Libra while the other has an ascendant in Cancer. You might expect the Sun in Sagittarius to make both of them party-loving extroverts. However when you meet the person with the Cancer ascendant, she is probably quiet and reserved, maybe even shy. 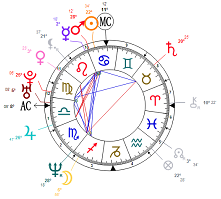 While the person with Libra ascendant is very nice and accommodating to everyone he meets. When you first read your astrology chart, you may be tempted to look up each individual planet. But you're only going to be getting a small glimpse into your natal chart's story. If you really want the full picture, you have to weave everything together to tell the story of you as an individual. That's what a good astrologer does. 1. Look at your natal chart and write down where all the planets are (in which houses and signs). Also make note of your ascendant (a.k.a. rising sign). Think of the planets as what you do, the signs as how you do it, and the houses as where you do it. 2. Interpret the planets in the signs by studying their general meanings. This will give you insight into what you do and how. 3. Interpret the planets in the houses. This will tell you the areas in your life where you do the things you do. 4. Interpret the cusps – the rulers of the houses. It's easy to find the ruler of the houses. The ruler is the planet that governs the sign in the house. For example, Jupiter governs Sagittarius. If Sagittarius is in House V, Jupiter will have an effect on House V…even if Jupiter is located in a different house in your astrology chart, such as House III. The sign on the cusp (Sagittarius in our example) shows your attitude towards things involving the house (House V – love, creativity and children). The planet in the house shows the actual circumstance. As for the effect, let's say Jupiter is in House II (money). You may spend a lot of money (House II) on your hobbies (House V). 5. Interpret the aspects. Aspects are the relationships between the planets in your natal chart. They tell you whether a planet's energy will be expressed easily or with difficultly. The most important aspect to look for is a conjunction to any of the four angles (ascendant, MC, descendant, and IC). If a planet is in conjunction to one of the angles, you may identify strongly with that planet's traits. 6. Look at the elements. Count how many of each element you have – fire, air, earth, and water. People generally have 3-4 of each element. However, if you have 5 or more of one element, or 0-1 of an element, this can have an impact in your temperament. 7. Look at the qualities. Count how many qualities you have – Cardinal, Fixed and Mutable. The qualities reveal how you respond to things and deal with stress. Tip: When doing your interpretations, leave everything open to other possibilities. Nothing is set in stone in your astrology chart. All it reveals are potential outcomes.